The 60V MAX 7-1/4 in. Cordless Worm Drive Style Saw features a blade oriented to the left of the motor and the handle positioned at the rear of the saw to optimize line of sight when cutting. An electronic brake helps stop the blade after the trigger is released. Bevel capacity is 53 degrees with stops at 45 degrees and 22.5 degrees. The saw achieves smooth, accurate cuts and long runtime with a durable, high-grade magnesium shoe and an efficient brushless motor. This Cordless Worm Drive Style Saw achieves 2-7/16 in. depth of cut at 90 degrees. Hang the tool conveniently with the included rafter hook. It's ideal for use in a variety of wood cutting applications such as oriented strand board (OSB), plywood, hardwoods, dimensional lumber, and flooring. Many of the professional contractors using this tool include framers, concrete formers, carpenters, and general contractors. DEWALT high powered cordless tools come standard with a 3-year limited warranty, 1-year free service contract and 90-day money-back guarantee. 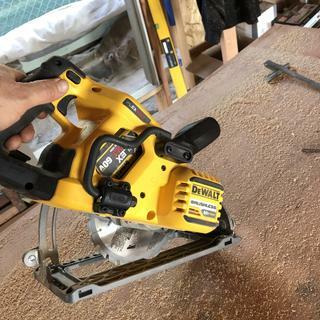 This is simply the best battery circular saw i have ever owned. it has every bit of power i could want. battery life lasts a lot longer than i thought, and i am not using the biggest batteries. Not what I expected, but a beast nonetheless. Well I did not see this coming, this is now the 3rd saw in my lineup of what does the best job in the least amount of time. (all left blade) I own 6 1/2 brushed with Flex Volt batt, 36 volt 2.0 amp hour batt, and this, 60 volt brushless/wormless left blade 9 amp hr batt. If I can learn to steer this much energy by eye, like the table saw is the death to the radial arm saw. This is the death of the table saw to mobile energy. One can carry it it in one hand, all the setup and breakdown time is removed from the job. Tip of the hat to the DeWalt team on this one, you designed, delivered and are sold out of bare tool. Do these saw s have tracking devices built into them? As in anti-theft? They do not. Do the 60 volt Dewalt cordless saws have tracking devices built into them? Is this saw compatible with the 9 ah 20/60 volt battery?